1. I creep into her room when she is sleeping, and I sit in the rocking chair watching her sleep, hearing her breathe. It calms me. A beautiful moment, now, but I imagine myself doing this, when she is too old for it, and in my head I look like a creepy clown from a horror movie, with a deranged smile and unidentified red stain on my lips. 2. I kiss her on the neck, face, mouth, belly. All the time. I can’t stop kissing her. At some point, this will totally gross her out, and probably be very awkward. 3. I spy on her with the monitor. I listen to her when she plays in her crib and talks to herself, reads herself a book, and when she cries for 30 seconds or so right before she falls asleep. I like that I can know what she’s doing without even being in the room. At a certain age, I know that this will be a huge infringement of privacy, so for now I’ll enjoy the fact that I can explain it as conscientious parenting. 4. I stare at her. While she plays. While she sleeps. While she eats. While she’s playing by herself. While she’s in someone else’s arms. While she’s discovering something new. While she’s pissed off and tantruming. While she’s making silly faces at me (ok, then I’m usually making them back). I will ever stop staring, I do not care if I am creepy-peepy, I just love watching her. I love watching her be. I will be the eerie eyeballing mother forever. 5. I call her my baby. That was actually her first word – baby. I didn’t realize how much we called her that until she started saying it, so well, and so often. Good morning my baby! Is my baby tired? I think it might stem from the fact that while pregnant, Mr. Grouch kept saying, “we’re having a BABY!” because we couldn’t believe our good fortune after trying so long. For quite awhile after she was born he’d say, “We have a baby!” because we still couldn’t believe our little human windfall, who is so marvelous, and all our own. 6. I bite off pieces of food with my teeth and give them to her. I know……it’s just that sometimes it’s easier than using a knife. Bonus: I can simultaneously make sure the morsel isn’t too hot. Still, I have no true excuse for this one. I would like it to be noted that I do NOT chew it up. I’m no mama bird. 7. I analyze her poop. And don’t think too much about getting it on my hands or clothes. And I talk about it with other parents. Runny? Hard? Brown? Orange? Coming up out of the back of her diaper coating her scapula? It’s not gross, it’s just the process of how the body functions (and how sometimes diapers don’t). I am happy to wipe her dirty little bum, so she’s clean and dry. I want her to be taken care of – even if this sometimes requires a direct plunking into a tub full of suds. 8. I stick my fingers in her mouth. Do you have a tooth coming in? OMG did you put a chunk of grass in your mouth? OMG did you reach in and pick out a chunk of foam from your car seat liner and shove it in your mouth? OMG are you chewing on cat hair/a bobby pin that fell out of my pocket/an eight-day old Cheerio? Most of these don’t sound cute, even now. 9. I’m a stalker. I want to know everything what she’s doing and how she’s doing it, no matter how trivial the activity may be. Playing at daycare? With who? Does she share? Is she a leader? An observer? A follower? Is she having fun? Is she happy? How does her behavior change day-to-day? What did she eat? How was her poop? I am quite sure that I will still want to know most of the seemingly monotonous details later in her life (maybe not the poop one), even if she asks me, “Why do you care, Mom? It’s my life, not yours”. But, when she asks me these things, I know it’s because she just doesn’t get it. She is my life, too. I know these habits are totally normal for the mother of a one year old, but at what point do these become absolutely creepy? What are your cute/creepy habits? 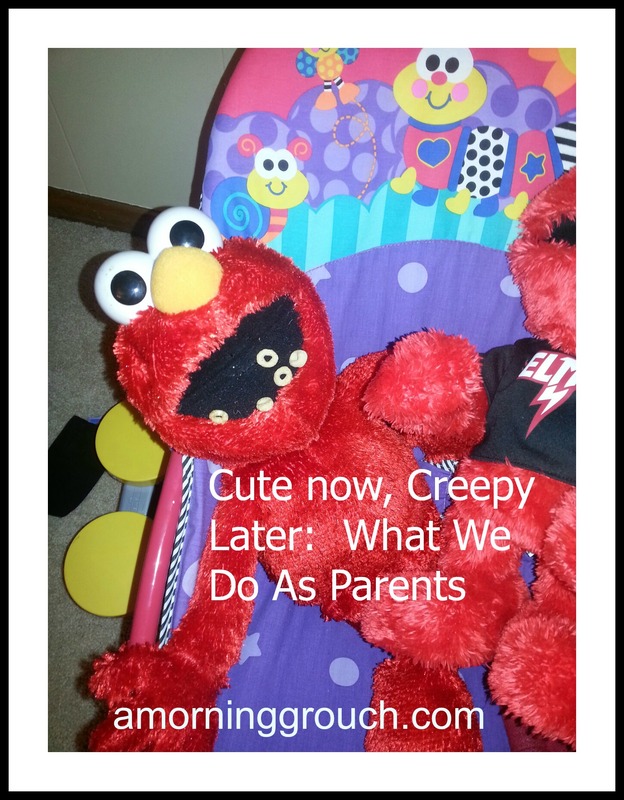 What we do as parents is cute now, but would most definitely be considered creepy, later. Oh goody!! I have time to keep creeping! Haha that’s awesome. I wonder if we’ll do the same….time will tell. Yep. I’ll take my cues from her. Ya I know I am waiting for mine to tell me the same thing! Every moment spent with someone you love is what you describe – magical. I also used to bite pieces of food whilst feeding my son – I agree, utensils don’t seem to get the job done at times!! (Very) Proud dad. This made me laugh out loud more than once as I pictured you doing each thing to a teenage girl, so good thing I’m sitting in an empty room. On a related note my husband thinks I’m overly obsessed with the dog’s poop status and tells me so whenever I give him a poo report (it’s important, ok? duh!). Sometimes I wonder if this says something about his papa qualifications. Is the poo obsession a mom thing? I’m guessing once it’s human poo he will be more open to the conversation!